I’ve bought all the love cards I care to at Parker & Otis. I hope you don’t mind I found this one in the best-friends-for-life section. I also hope you don’t mind it will date me in less than a year but then again I suppose that’s the point of anniversaries, to date us. Today, we celebrate twelve years of dating each other. 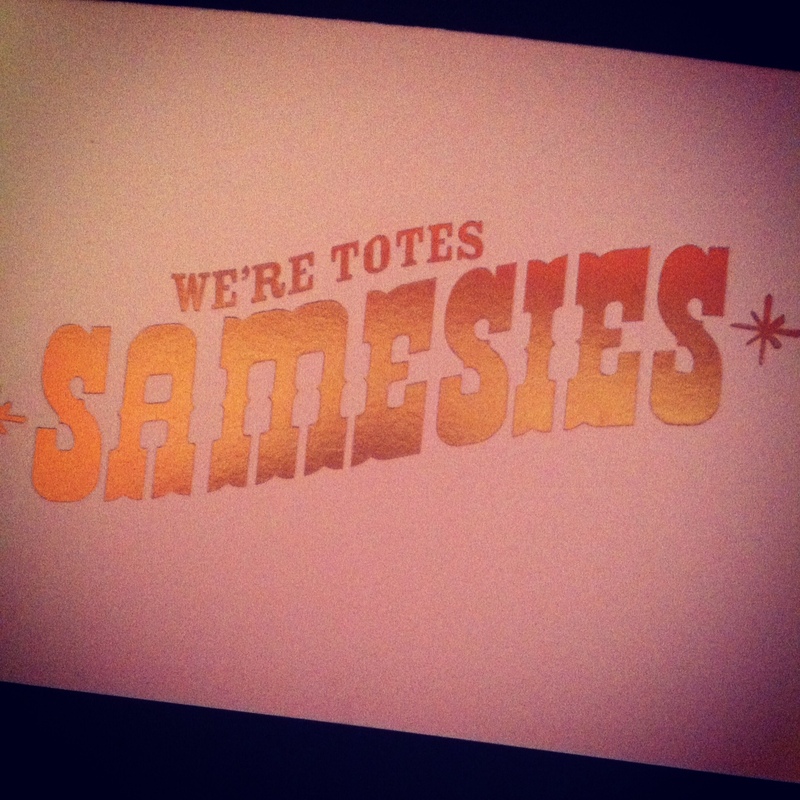 In many ways we are “totes samesies.” We fancy ourselves the adventuresome, spontaneous types but on a night when we’ve “scheduled for the unscheduled” we go for sushi and a Redbox. (On the way to sushi, I remind you that we have free booze back at home, and you remind me that this is being neither adventuresome nor spontaneous.) We share the same unabashed taste in pop culture, turning to one another during car rides to wonder aloud, “Don’t you love how Taylor Swift is just killing it right now?” We agree that the one regret of our time together is that we didn’t adopt Amelia’s sister pup when we had the chance, although she had a snarltooth we’re not sure we could have looked past. We may be more alike than different but it’s the differences that have kept us growing. When people ask what’s been the hardest part of this love, I blame the whole “two become one flesh” thing. I’m convinced it’s a metaphor with holes like any other. After all, it seems those ancient writers were using it primarily to point to God. And within the tradition of a trinitarian God, the one source is still uniquely three persons: a diversified unity, they say, a reconciled diversity. No one ever taught me how a Christian woman is supposed to become one without losing her person. I told you this year I prefer Rilke’s definition of love: “that two solitudes protect and touch and greet each other.” You meet your needs. I’ll meet mine. If ever the two shall overlap, it is happy accident but not requirement. I’d rather have a side-by-side companion than be working in tandem. You say this is not what you want. But when we become one, I find my oneness eclipsing yours; like when you say you want to decide together what we’ll eat for dinner and I say okay and then you say, “So what are you thinking?” and then I decide for the both of us. I say this is not what I want. I do not want to be one if one means I am the primary one. When we married, we agreed to take turns when it came to decision making. We followed your career for the first two years, after which we chased mine west for another two. I got a bonus turn when we moved back east for my graduate school program but there was a job waiting for you too. When I was ready to move again, I considered that I was always ready a little earlier than you. Maybe you might like to stay this time. And so we have. I’ve begun to recognize how there’s always something for me where you go and always something for you where I am. I’ve come to think God sees us as one, even when I can’t. And so, today, as we celebrate twelve years of love, I want to celebrate twelve years of two solitudes, one flesh. May we never have to choose between being ourselves and being in love. May we always know how to give ourselves away without giving up who we are. And may we trust that being one makes us a better two and being two makes us a better one. May we be mirrors of God. what a beautiful love letter.